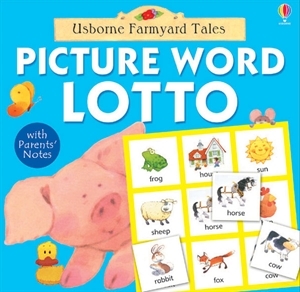 Picture Word Lotto is a game from Usborne Books & More that I purchased a couple months ago since a friend was asking how it was and I hate selling something I haven’t tried myself. I haven’t had a chance to try it out until recently and am sort of kicking myself for not doing so sooner. It’s designed for up to 4 players and it says for ages 4 years and up on the website but the game box itself says for ages 2-6. My 2-year-old and my 5-year-old were both playing and having a ball so I’d say the age range on the box is accurate. It comes with 4 boards that have pictures and words on it. Then there are two sets of cards. One set has pictures and words and the other set has just words. You can play with either set depending on the ages of the players. We started with the picture cards. I laid them all face down and we took turns picking a card. One person would flip a card over and say what picture they had and everyone would check to see whose board had the card and then place it on their board. Whoever fills up their board first wins but we kept playing until everyone’s board was filled. I was surprised how quickly my 2-year-old picked it up and then the second time we played we used the word cards and I was amazed at how many words both my 2-year-old and 5-year-old could recognize. For the ones they didn’t know I had my 5-year-old sound them out. For my 2-year-old I had him look for the word on his card so he could work on his matching skills. So not only is it a fun game but also a good learning experience. Definitely would suggest this one to other parents!